Look at the picture above. You see me placing my hand on the student's abdominal area. This is the location of the area that you want to expand at exactly the moment you inhale. The lower rib cage will also automatically inflate as does the back area. 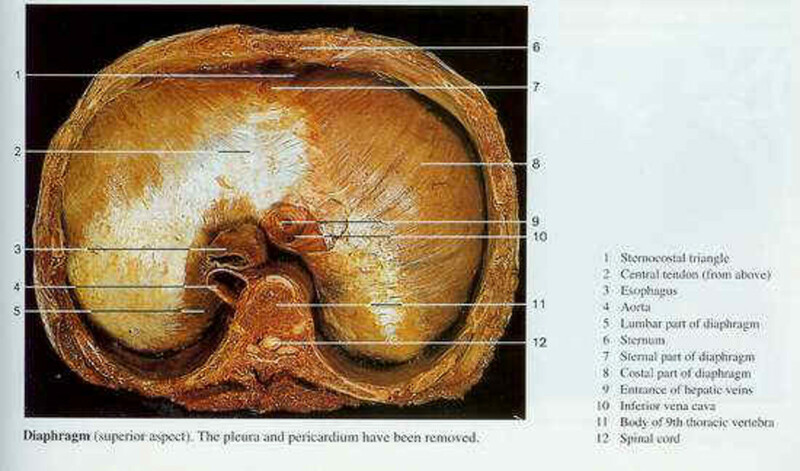 Your diaphragm is located right in the center of your body and separates the abdomen from the chest (thorax). It is the primary organ used for breathing. When you inhale the diaphragm expands causing the ribcage to inflate. With the ribcage inflated the lungs expand to hold more air. 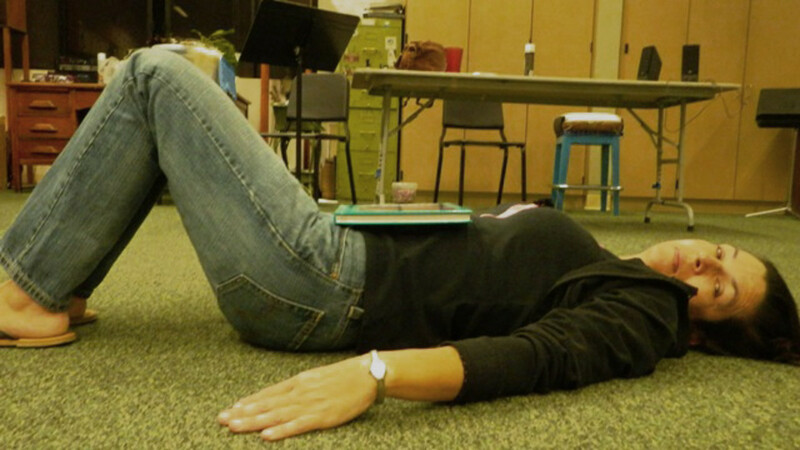 It is much easier and faster to learn how to use the Diaphragm by laying flat on the floor. After this new way of breathing becomes easy to do with the floor position, you may stand and practice. If you still find it difficult in a standing position, go back to the floor position and keep practicing until inflating around the waistline and ribcage become automatic. Let's get started and learn how to breathe from the diaphragm. Be patient - it takes time to learn this method. The health rewards are well worth it. Lie down comfortably on your back on your bed or on a mat or carpeted floor. Position yourself with your feet flat on the floor and your knees bent (pointing upward). Simply follow your breathing for a minute or two with your attention. See if you can sense which parts of your body your breath touches. Put your hands (one on top of the other) on your belly, with the center of your lower hand touching your navel. Watch how your breathing responds. You may notice that your belly wants to expand as you inhale and retract as you exhale. Let this happen, but don’t try to force it. Dogs, cats, and babies do this naturally and so do you as you drift off to sleep. I often place a "yellow pages" book on the belly in place of the hands. This adds weight and aids in a more pronounced feeling as you inhale. 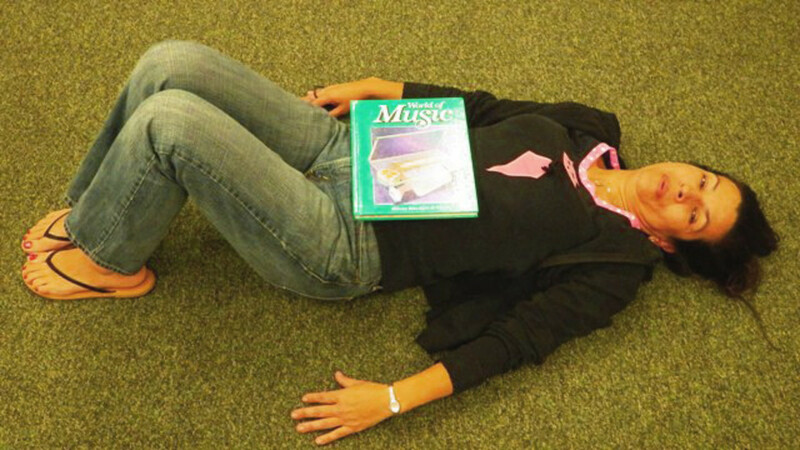 With the weight of the book resting on your belly, lift the book as you inhale and hold it for about 5 seconds. Then lower the book slowly as you exhale all of your air. Repeat, 5 or 6 times, breathing through the nose and out through the mouth. Repeat this exercise, but this time replace just holding the book for 5 seconds with singing the numbers, 12345678910. Lower the book as you sing, expelling your air slowly. Repeat the above exercise and increase singing the numbers to 15. Repeat again, singing to 20 or as far as you can. DO NOT STRAIN. Going through the same physical movements, sing a simple song such as "Happy Birthday To You" or "Amazing Grace". When you need to take a breath (at the end of each phrase), make certain you are inhaling from the belly. When the above exercises feel easy and more natural as you perform them, repeat all of the above steps in a standing position. This is more challenging, so do not rush it. Are you breathing correctly? (You say to yourself, “what kind of question is that?”) Of course, I am breathing right (and you inhale, then exhale just like you have done your entire life.) Well, while this type of breathing has obviously kept you alive...there is a better, healthier way to breathe. Singers, actors and public speakers are familiar with this better way of breathing as it is the foundation of their success. I am going to teach you how to breathe by using the diaphragmatic muscle, your breathing muscle. Once you incorporate this new way of inhaling and exhaling, you will enjoy better health, a more stress-free life, a higher level of spirituality, glowing skin and an improved singing, and speaking voice. The average person breathes 12-16 beats per minute, 720-960 beats per hour or 17,280-23,040 per day. The air we breathe in a lifetime equals the volume of two football fields, seventeen stories high! When we breathe through the mouth, over time the jaw can shrink causing crooked teeth. Breathing through the mouth is the biggest reason children develop a lisp when they talk. Because we can’t see air, we tend to forget it is even there. Air is something we just don’t think about. We also don’t really think about breathing air into our bodies, unless we practice yoga, voice and such. Perhaps you have choked at one time or another, which certainly makes you stop and think about having enough air. As most of us have learned in school (and forgotten), one fifth of the air we breathe is made up of oxygen (21%), and the rest is nitrogen (78%) in addition to small amounts of *argon, carbon dioxide, and some other gases and water vapor (1%). Every day we breathe about 35 pounds of air! I think that is pretty amazing. If the lungs were open flat they would cover the size of a tennis court. * Argon is the third most common gas in the Earth's atmosphere. It's 23.7 times as abundant as carbon dioxide and 500 times as abundant then neon. Use the link provided in resources below to learn more about Argon. Diaphragmatic breathing is the powerhouse for our voice. This type of breathing, when used properly, helps us to control the very sound of our voice. 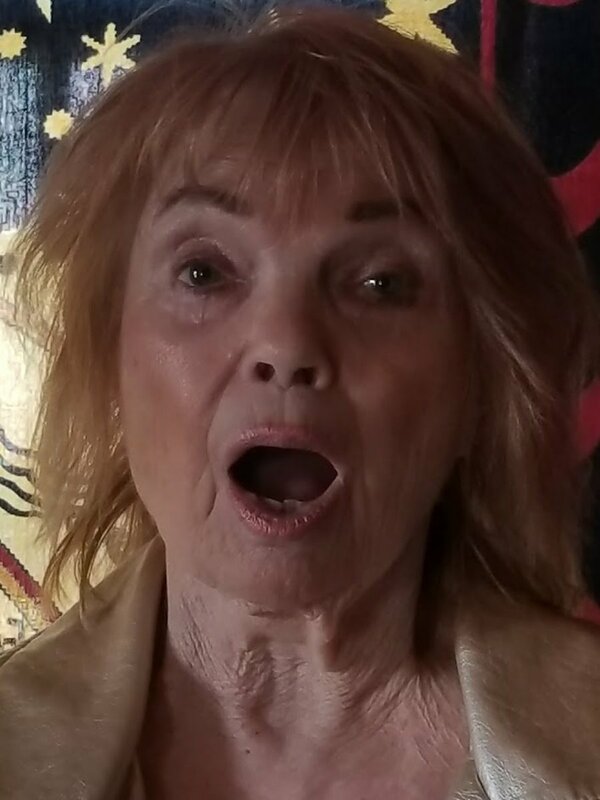 You may be surprised to learn that when we sing-off-key, or out-of-tune, it is often because we lack the amount of air needed to cushion our tone. When this happens, we end up singing flat. It is my belief that breathing is also the primary avenue to a higher consciousness and the more we can be aware, the more conscious we are. The ability to concentrate on our breathing will assure us that as we sing we have more control over our sound. The simple act of breathing starts a chain reaction of life-giving energy flowing through our body and mind. The breathing techniques you learn here can alter your mood, control pain, and even give us the courage to face daily challenges and obstacles. Begin to explore just how this fantastic body of ours can learn the art of diaphragmatic breathing, or, the belly breath. Your diaphragm is a large dome-shaped, flat sheet of muscle, shaped like a parachute, just below your rib cage and above your abdomen (your belly). By using your diaphragm when you breathe, you help your lungs expand more fully so they take in more air with less effort. 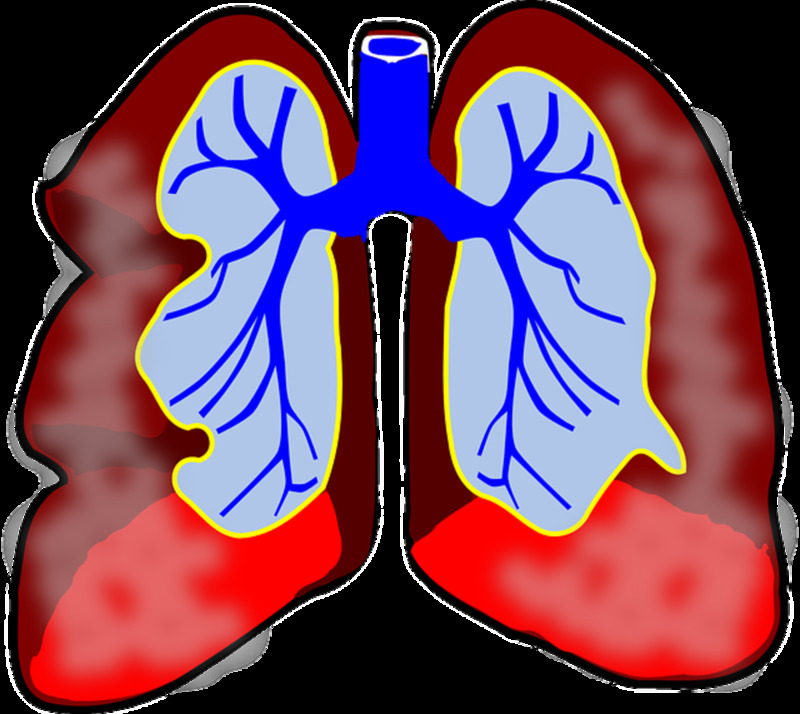 During normal breathing, the diaphragm naturally flattens, drawing air in and out of the lungs. During singing, the diaphragm flattens more deeply than during regular breathing. 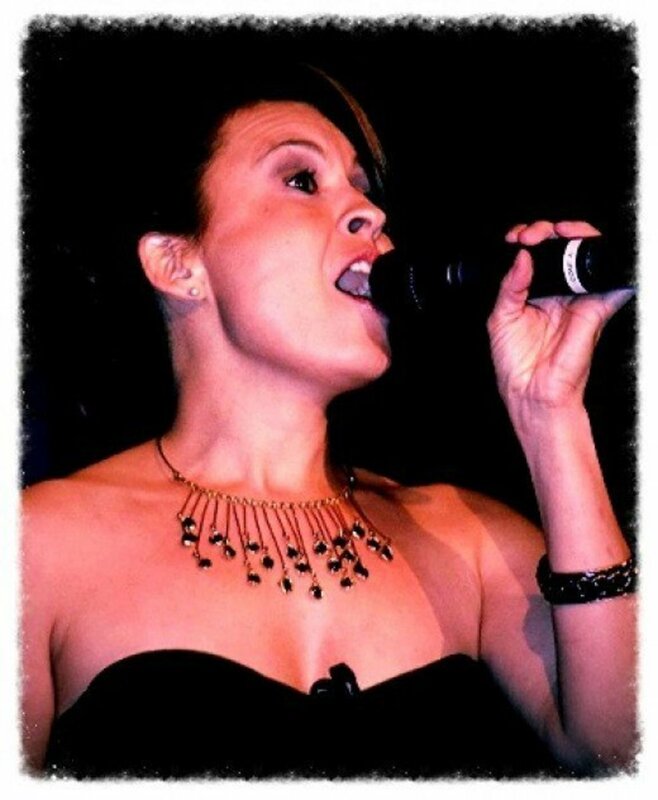 The singer must learn to preserve the extra amount of air in the lungs to support the small amount of air that's released across the vocal folds (bands). Picture a balloon. As you fill the balloon with air it expands. 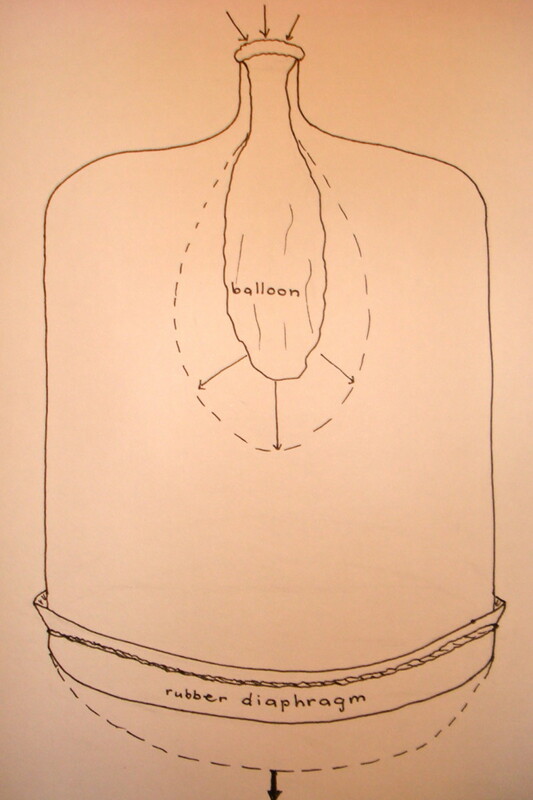 When the air is released the balloon will collapse. This is how the diaphragmatic muscle works. Bending from the waist, place both forearms on the thighs as pictured above. Allow the neck to hang freely. Take a deep breath from the belly (diaphragm) and feel the expansion in the back area. Don't be alarmed if you can't feel back expansion while in a standing position. Expansion occurs whether you notice it or not. When your diaphragmatic breathing becomes automatic, you are then able to hold notes longer and increase your vocal range. To sing higher, your body needs more breath pressure. The only way to increase this pressure is to use the belly breath or diaphragmatic breathing. It takes more air to sing higher than it does to sing lower. As you practice singing from low to high do not increase your volume. Singing louder will not help you to reach those high notes. You are at risk of damaging your vocal cords when you pump up your volume. Sometimes, we only have a minute or two to bring ourselves from a stressful feeling to one of relaxation and peace. Deep breathing ( Belly Breathing or Diaphragmatic Breathing) increases lung capacity and absorption of oxygen by the body. Even if we only take one or two quick deep breaths, it can make a significant difference in helping to relax during a stressful time. Belly breathing can take us from a state of confusion to clarity. To help reduce pain, deep breathing through the pain can be a distraction from the discomfort, especially when adding visualization techniques. Using your rib cage and abdominal area upon inhalation helps to boost your immune system, lower the oxidative stress that causes aging and fuels every cell in your body. Changing your breathing immediately affects the mind, body, and soul. Begin now to make an important lifestyle change. Practice, practice...then practice some more. Mastering diaphragmatic breathing will put you in direct contact with your body as you discover how your body moves while breathing. For the singer, managing the air can drastically change the sound of the singing voice. When you don't use a consistent flow of air, you have to squeeze in your throat which creates a tighter sound. This tight sound interferes with the beautification of tone. Even though breathing is natural (you don't think about it), when you sing, it is necessary to train your body to breathe in a certain way so that you breathe efficiently throughout the entire song. Unless you breathe properly, you risk running out of air right in the middle of a word. And you want the freedom of holding a note for as long as you need to. Diaphragmatic breathing is the foundation for confident speaking and singing. To learn this principle, practice the step-by-step exercises provided in this article. Practice several times a day for as long as it takes for you to learn. It must become entirely automatic. This means that for some, a few weeks will be all that is needed but for others, it may take several months. A great benefit for learning this new way of breathing is how we are able to get more blood flow and oxygen to our brain. This all adds up to living a healthier and more productive life. Yes. I have learned so much. Yes. But I will need to review again. Somewhat. But glad I read it. No. Too much to learn. while in a sleeping position, my belly expands more than while standing. 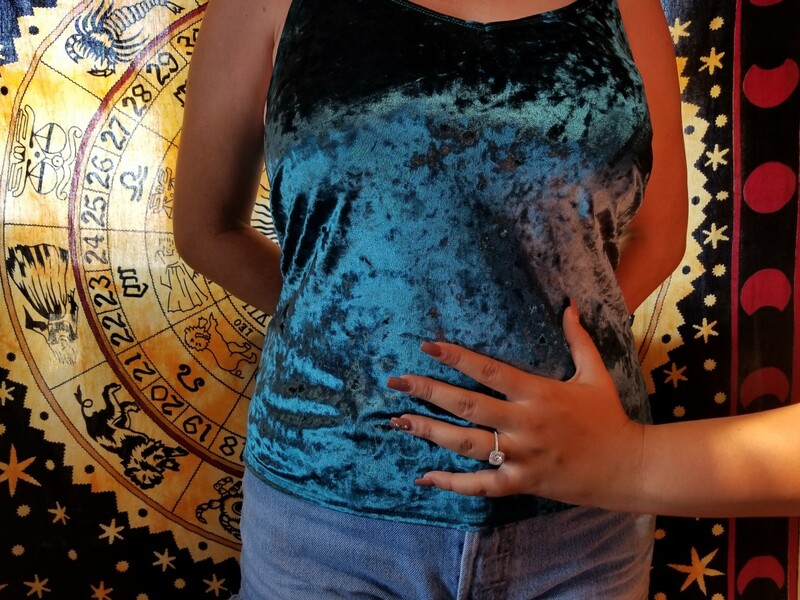 what should I do to expand my belly the same amount while standing? 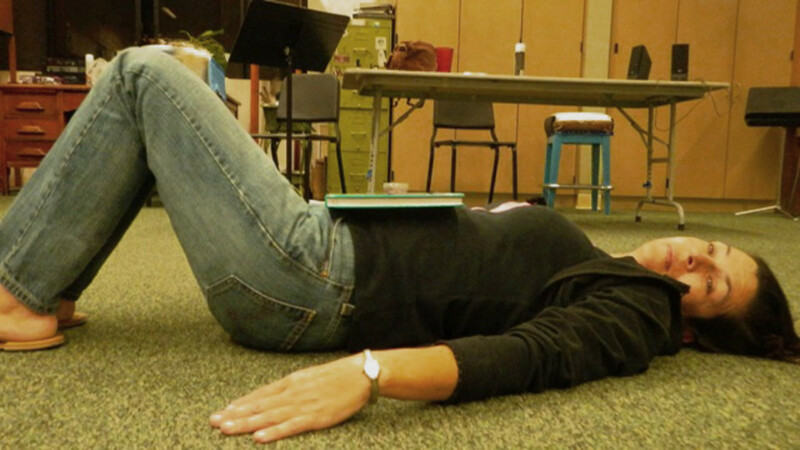 Continue practicing in a sleeping position until your body has "memorized" the belly breath. It's normal to feel less expansion while standing as the back area expands when standing. Will I be able to tell the difference in my voice between breathing from the diaphragm and anywhere else? Absolutely! It's the proper place for breathing. This is really awesome, I'm a diction coach and I believe this will greatly improve my work style. Thanks a lot ma'am and God bless you. It is the right way too go about warming up before you start singing a Song. I'm glad to hear that you have joined a choir. This is a great way to practice your vocal techniques. Keep it up and if you need my help, send me an email. I am in a choir. I am amateur singer. I like what you are saying about singing. It is Interesting. Thanks for liking my article on How to Breathe From the Diaphragm. This is such an important lesson for singers. Hope to see you again. In a sitting position, lean forward allowing your entire upper body to relax. Take a deep breath from the diaphragm and focus on our back at the ribcage area. In this position you will feel expansion in the back area. It's difficult to feel when in a standing position. Practice this often. Thanks. It would be best if you concentrate on using your present vocal sound the right way. Perhaps this is what you mean. Yes, your sound can be changed depending on just what your expectations are. Please email me for more help in this area. Thank you. Thank you for your question. You should not be feeling any pain or discomfort at all with diaphragmatic breathing. Simply allow your abdomen to inflate naturally as you inhale. Remember - no pain! I'm going to try this awesome technique but can I ask you a question? I have been chest breathing for a long time, purely for vanity reasons and I believe this has had an adverse effect on the strength of my diaphragm. About one month ago I started to focus purely on diaphragmatic breathing and I feel it is helping, but I have a pain just under my sternum sometimes, and I think this is due to trying to breathe too deeply when standing and also due to the fact that my body isn't used to this style of breathing. At night, when I am sleeping, I don't feel anything, so I guess this is why we are encouraged to try diaphragmatic breathing lying down first? Is it 'normal' to feel a difference / a little bit of pain when switching to this type of breathing, or do you think I am pushing my stomach out too hard when I am standing? Humming regularly has been shown to relieve a stuffed or plugged nose. The vibrations that occur during humming energize the membranes. I just wrote a hub about it Liz. Give it a try and thanks. From singing to exercising, always the instruction is to "breathe in through your nose and out through your mouth." This is a problem for me. Between having allergies--particularly in spring and summer--and the fact that I recently found out I have a deviated septum, nose-breathing is hard for me. I often feel as if my nose is partially plugged, and as if I'm not getting enough air. Almost a suffocating feeling at times. The doctor I saw said there is a surgery to correct the physical issue, but he also said it is not always very effective. That backs up my husband's observation that both his step dad and half sister had that surgery, and that it really didn't help them much. I'm told it's a pretty painful surgery, as well, and I'm a bona-fide wuss! So, now what? :( I'm not trying to be a Negative Nora; just reporting on my particular issues...and experiences. I have had the privilege of attending 2 Classical Indian Concerts and enjoyed them immensely. I noticed the amount of control these singes used with the breath. Also the release was complete and clean. Thank you for your generous vote and for sharing on HP. Breathing rightly is so important for singers. These are excellent tips in general and especially for singers. In classical Indian singing also, a lot of stress is given on breath control and release. It needs regular practice in order to sing well. As always this is a wonderful, informative and helpful hub for everyone, particularly for prospective singers. Voted up as interesting and useful and shared on HP! Great tips here and expressing the importance of learning to breath properly. I remember doing these exercises in our music class so we could sing better. It has stuck with me over the years. I still use some of these to help ease my stress. Thanks for sharing! Audrey, we had to learn to breathe and speak from our diaphragms when I was in broadcasting school. It's no easy task. These exercises would have been helpful. 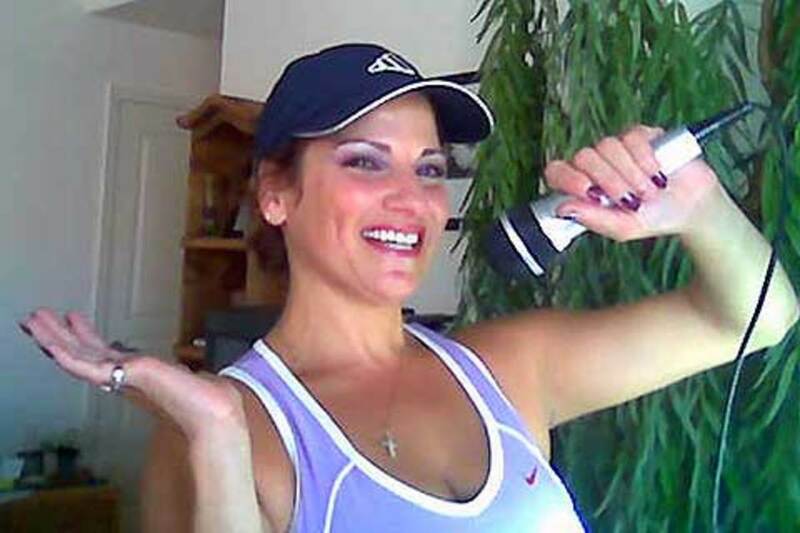 Dianna - This exercise is also a fantastic way to send oxygen to the brain. I also like it for relaxation. Thank you for your support! 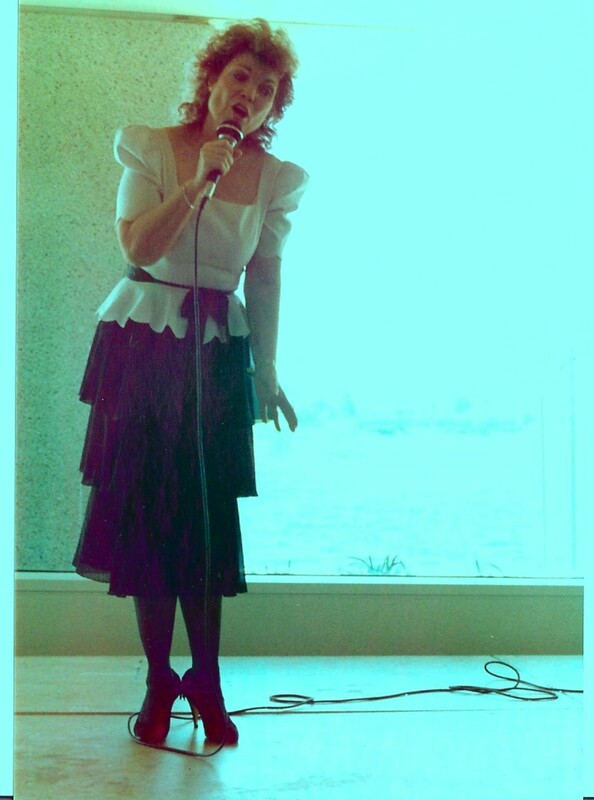 I have been singing all my life and early in, professionally. I suffer from sinus problems and pretty much stay congested! Right now, I have an infection , so am in antibiotics. I perform, but can't seem to clear my head. I sounds stuffed all the time. Help! StephSev108 - Hooray! You like my hub and will be learning how to breathe by using the diaphragm. Best news I've heard all day:) Thank you so much. Another awesome hub. I have always had shallow breathing. I will implement your strategies. It's time for a change. Thank you. Vellur - I love your own quote - "Breathing properly is the essence of life." May I use this on occasion? Thank you so much! studdent - The key is "consistent practice" combined with concentration and awareness. ALWAYS be aware of your breathing. Make it a point to inflate around the waistline every single time to take a breath and it will one day become automatic! KT Banks - I'm so very glad to see you here and to know that my hub has helped you with breathing. Few of us use our bodies corretly when inhaling. That is one reason I recorded breathing lessons on CD. If you practice laying on the floor on your back, place a book on the abdomen centered at the waistline, and lift only the book at the same time you inhale, your body will soon adapt to this way of taking in air (inhalation). This is the best way to quickly remove stress from both the body and mind. I wish you great results! Breathing properly is the essence of life. Thank you for this hub, very informative and refreshing. We all need to breathe deep. Voted up. I'm so happy to have found this hub. I've been meaning to work on this for quite a while now, however, I didn't really know where to start. A few years ago, I went through a period of great stress, and several people, including doctors, kept telling me that I wasn't breathing correctly. They said I was breathing with my chest and taking too many shallow breaths. EuroNinila - It's great to see you here and thank you for your comments. I love sharing breathing techniques with someone like you who appreciates the process. This is an awesome hub and Thankyou for sharing. I had a sociology professor teach the class this valuable breathing tehnique and I'm glad that you've shared it as well. It definetely is a good way to relax you in a minute if your feeling nervous. freesinginglessons - Thanks so much. Appreciate your comments, especially coming from another vocal coach! Yes, excellent hub about breathing properly. I took singing lessons after leaving school and follow the technique of breathing in and out from the stomach. If it hurts your doing something wrong. You hit on very important points about properly training your voice the safe way. Great Information for everyone! Excellent information! When I was in my twenties I took a few vocal lessons. It is amazing I had been breathing the wrong way my whole life. Silver Poet - I am pleased that you are interested in applying diaphragmatic breathing as it truly makes a big difference in ones health. Thank you so much! Daniel - I thank you so very much! My purpose in writing vocal articles is to help others and you are helping me do just that. I am overjoyed. Peace and love to you Daniel. I had always heard that breathing in the manner you've described was healthier. Thanks for the reminder! There is no such thing as good vocal pitch without proper breathing to support it. Fabulous hub. Definitely referring it to my singer friends for their use and to forward to their students. Thanks! hello, hello - This is a very healthy way to breath and becomes automatic after a little practice. Breathe deep and often :) Thank you, my friend. wilbury steve - Learning diagragmatic breathing can change your life, for the better as well as help you sing much better. Thanks for your comment and hope to see you real soon! QudsiaP1 - Very nice to see you here. Thank you for your comment. Peace and joy to you. Lilly - well...as long as breathing is what keeps us alive and kick'in, we might as well breathe the way our body was meant to breathe. :) For some, this is a daily challenge...yet others seem to pick it right up. A tip to help, is to place your hand next to your abdomen just as you are dozing off and you will feel the inflation as it occurs naturally. Thanks, my friend for visitng and leaving supportive comments. Appreciate it! amy - I am so very pleased that you enjoyed my hub on breathing. So few of us really understand the value of using the diaphragmatic muscle when singing and when speaking. I appreciate your lovely comments, amy. Have a spectacular day! Micky, my beautiful friend! May I have this dance? Isn't it great, how much we can learn from one another? So many blessings - here on Hubpages! Stay well, Micky! Great advice vocalcoach. I love this music too. Thank you for another great lesson as always dear one! This is a great hub VC, i am one of the many frustrated readers out there i am sure who are wishing they had had you as a music teacher! Voted way up!! Wonderfully beautiful page here in so many different ways. I took some singing lessons while in high school and enjoyed it so much, great advice here. 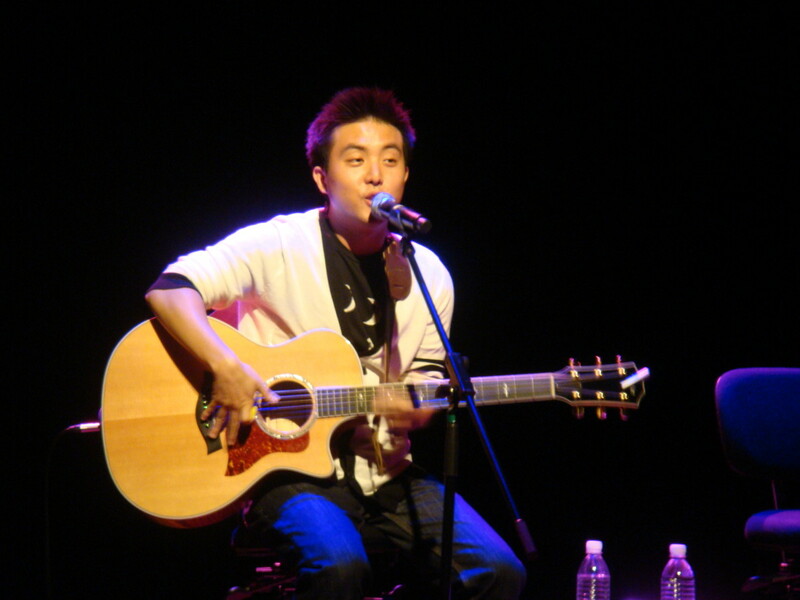 Love that you added the Rodney Yee DVD, I'm a big fan of his too!! A.B. Thank you! I need to print this in it's entirety, and hang it on my wall! Thank you for the excellent lessons of breathing...how can we forget to breathe? Lovely Topic, vocalcoach. I have been examining my breathing techniques in singing lately (I am a previous member of the Praise and Worship Team in my church ministry.) I was concerned that I was leaving my mouth too wide open, because I always have a tendency to cough when I use a lot of air to sing. I realized I was trying to sing louder than anyone else. I had to convince myself that I don't have to make such a big impression. God loves my singing even if I do it more quietly. So, I toned it down some. Then, after trying to sing like I was on stage the day after I caught upper respiratory congestion, I came down with the flu, and I feel that leaving my mouth too wide open and too long exposes me to the germs floating in the air. So now when I sing, I do not strain, I take breaths, not gulps, and when there is a pause in the song, I close my mouth. Thanks for your hub, and I enjoy brushing up on my musical skills when you share your advice. Happy Singing! Thanks my friend for writing this. I really enjoy this hub. I learn much from you about the miracle of breathing. I believe this. I am glad to appy your tips and get the benefit from breathing. Vote up. God bless you. Take care! I was mentored in collage by a vocal coach and by a dear friend in the entertainment industry (no - not him - a woman unrelated. ;-) ) Breathing exercises were here commands of me. I hated it, but my voice did improve under her tutelage. This is an excellent reminder that it is good for our overall health. Well done! I enjoyed reading this very much, & there's a lot of helpful information, the practical part of which I shall be making the time to try out very soon! cheers!! Very interesting and well explained. I bookmark this Hub becouse I want to follow your teaching. I do not sing, I do not make yoga... But I like feel my body, know it, and discover its potentials. Thanks! Thank you, Ruby, for this serious discussion of the importance of diaphragmatic breaching. It does make a difference. Since you are obviously an expert in the correct method of breathing, I have dedicated this funny 'truth' to you. When you prepare for the birth of your first child, you practice your breathing religiously. For the second child, you no longer bother practicing your breathing because you remember that last time, breathing didn't do a thing for you. For the third child, you request an epidural when you are in your 8th month. Reggie D. - I am just thrilled that you are putting my instruction to good use. Diaphragmatic breathing makes a huge difference in your presentation as a public speaker/voice over actor. I am here to help if you need me. Thanks, Reggie and I enjoy your hubs! Blessings. Very interesting article. My younger daughter has a magnificent voice and did take classical training as a teen. Breathing correctly was a big topic in our home. As I was reading your hub, I became very aware of my breathing. I noticed that I was taking short, choppy breaths. I immediately began practicing the techniques that you are sharing. I love doing voiceovers so I am anxious to apply this information to my next project. You've done it again...another great hub! Thank you for sharing. I will be visiting your website. Take care. I certainly was enjoyable to read, very detailed and an informative hub. Hello dear carrie - Thank you for being my first visitor! Thank you so much for these valuable tips on breathing properly vocalcoach.